Apple today announced that it will be joining Verizon in offering pre-orders of the new Verizon iPhone to existing Verizon customers as of tomorrow. Apple today announced an exclusive opportunity for Verizon Wireless' 94 million customers to pre-order iPhone 4 online beginning on Thursday, February 3 through the Apple Store (www.apple.com) and at www.verizonwireless.com/iphone. Due to high demand, customer orders will be fulfilled on a first come, first served basis. 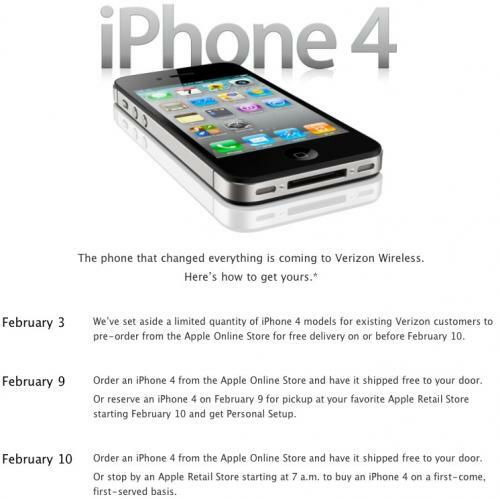 The company also announced that all other customers can begin ordering the Verizon iPhone for delivery or in-store pickup beginning next Wednesday, February 9th, although handsets won't be available for pickup until the following day. Apple's retail stores will open at 7:00 AM on Thursday, February 10th to allow customers to purchase the Verizon iPhone, with Verizon's 2,000 retail stores also offering availability. A day-by-day timeline of the launch process is posted on Apple's site.